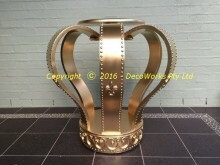 This post describes the finishing of the large crown display table frame. 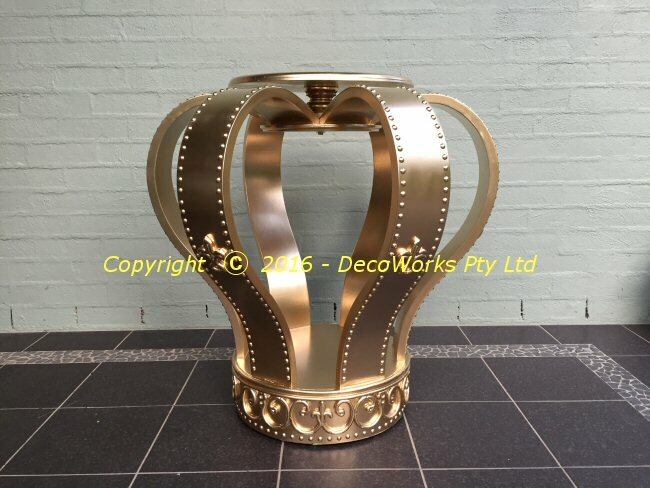 The table is 815cm high and was used as a display stand for a birthday cake however it could also be used in any situation that required a unique and stylish display centre piece. 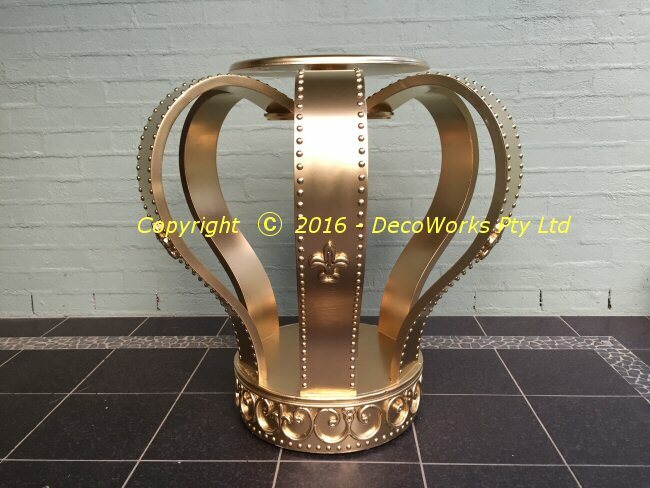 The main objective in making the large crown is to get the finish of the timber framework as smooth as possible. By its nature raw timber is uneven due to its grain. 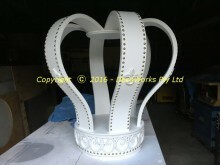 The crown frame was first sanded to remove large irregularities and then cleaned with compressed air. Next the first of several coats of undercoat were applied. The first application of undercoat was the most important as it absorbed into the timber causing the wood grain to expand. The timber crown frame was then sanded smooth again. 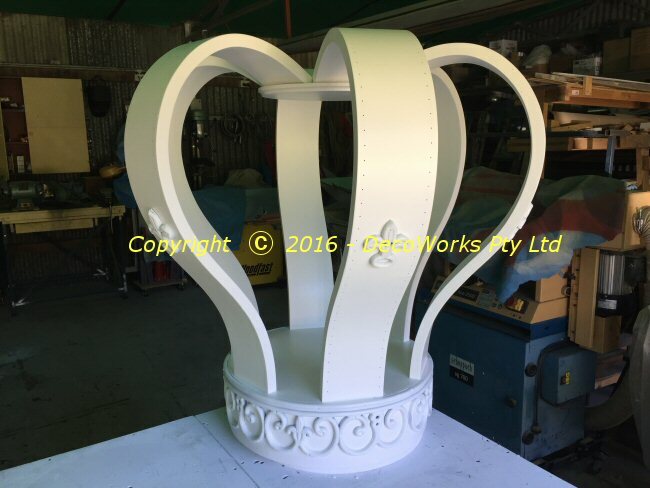 After the first undercoat any imperfections in the finish became blazingly apparent. 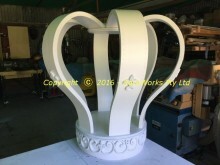 These were first filled with Spakfilla and sanded back again before subsequent applications of undercoat. 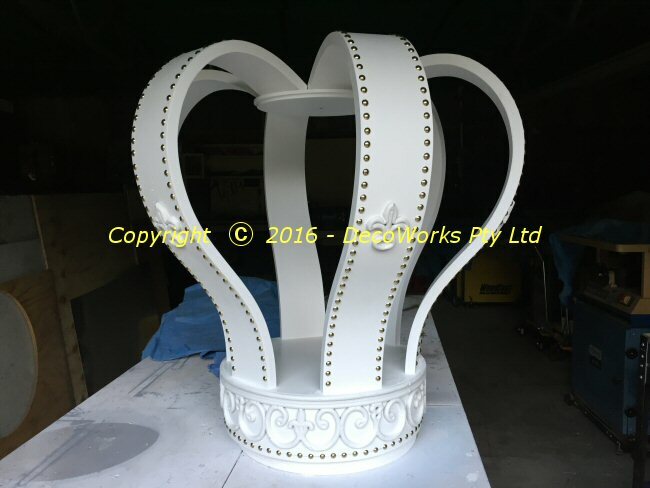 After each application had dried the frame was sanded back yet again which gradually filled remaining small surface imperfections. 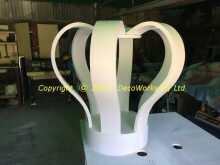 The display table had seven undercoats before the finish was acceptable. Once the undercoating was finished the decorative trimming was applied. 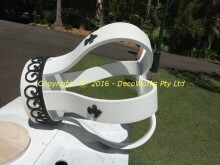 A simple fleur-de-lys was fitted to each of the six laminated curved sections of the large crown frame and domed brass upholstery nails were aligned along all the edges. 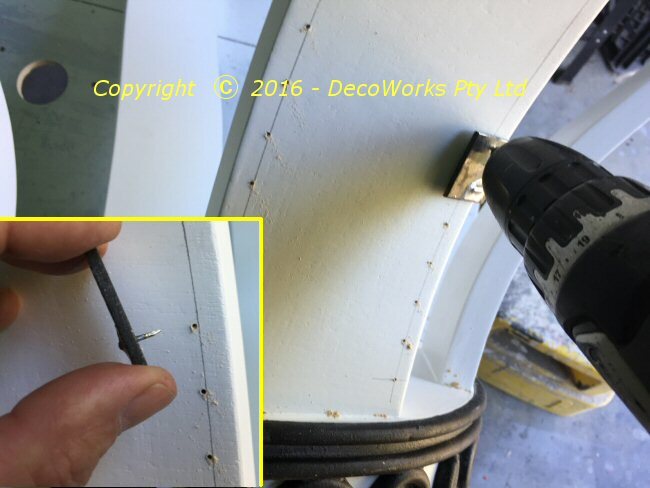 A small jig was made to drill location holes for the upholstery nails to ensure they were all an even distance from each other. After yet another undercoat application and light sanding of the timber framework the upholstery nails were fitted. It was better to leave the nails till last so that they didn’t obstruct the sanding process. After the upholstery nails were fitted the whole large crown frame was sprayed with metallic gold paint. This entry was posted in Projects and tagged display, props. Bookmark the permalink.